The daily admission price above includes access to Buccaneer Bay Waterpark. Daily admission also includes the mermaid show, wildlife show, and river boat ride. The park accepts cash and all major credit/debit cards. The park stops selling tickets at 4:30pm each day. Weeki Wachee Springs State Park does not offer group rates or other daily admission discounts. We do NOT offer advanced ticket, or online sales. Tickets can only be purchased at the gate upon arrival. Retired or active military receives 25% off. Persons with service-connected disabilities are free. Activities at the waterpark are seasonal. Visit Buccaneer Bay for days and hours of operation. Weeki Wachee Springs State Park is always excited to welcome its guests and supporters to come out and enjoy the environment, history, and recreation we have to offer. With this being said, please remember to arrive early. We open our gates at 9am, 365 days a year. Due to heavy popularity, the park often reaches capacity on weekends, holidays, and during the summer season. We highly recommend arriving when the park opens at 9 AM on a weekday, and much earlier on the weekends (Before 8:15 AM typically). We will close park entry until space for new guests has been made. Unfortunately, all guests who arrive after the park has reached capacity will be turned away and asked to return at a later time. This includes guests who are annual pass holders, have an existing ticket, and individuals affiliated with large parties that have already entered the park. We appreciate your patience and look forward to your visit. 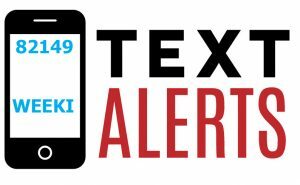 TEXT ALERTS NOW AVAILABLE: Sign up now for text alerts sent directly to your smart-phone by texting the keyword, WEEKI, to 82149. These alerts will include announcements regarding park closures, including capacity. A must-have if you plan to visit the park this summer. Access for ALL is our commitment to provide inclusive experiences to every park visitor. We encourage you to engage in the many accessible amenities located at the park. To find out more, please call the park. There are no refunds or return tickets issued for any cancellations, and/or closures due to inclement weather. Lightning will delay or cancel activities. Please check our local weather before making the trip.